What would you say to your younger self if you met them today? Would you tell them that you will in fact achieve all of the things you set out to do? To keep dreaming and wishing and telling your family you’re “going to win gold at the Olympics”? The gals from the women’s Rugby Sevens team sure would. 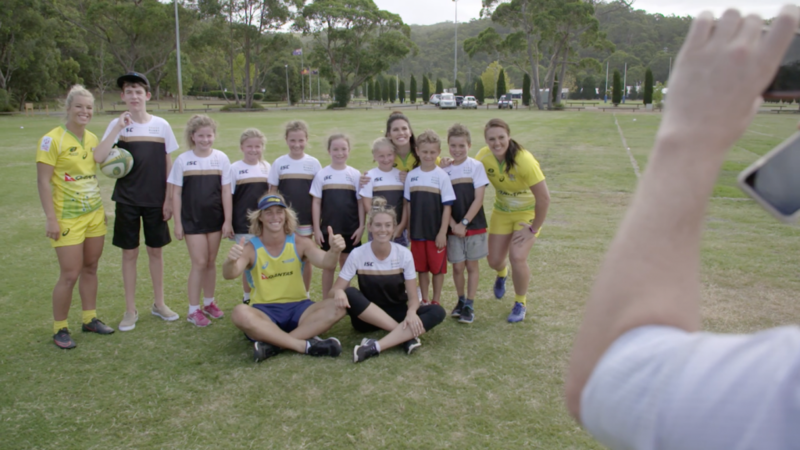 We chatted to Charlotte Caslick, Emma Tonegato and Sharni Williams about how their lifelong goal of becoming Olympic medalists actually came true. That achievement was especially groundbreaking, given nobody like them had ever achieved it before. “Growing up, there weren’t very many girls that played rugby in general, but that’s definitely changing,” says Charlotte. Achieving sporting success without having role models to guide them is truly admirable. Especially if you think about the fact that it’s only been four years in the making. Watch the whole video to see Charlotte, Emma and Sharni chat about breaking down barriers, the importance of role models, reaching the peak of their career and making their 8-year-old self proud. Want to earn Qantas Points for everyday activities like walking the dog, going for a jog or riding your bike*? Find everything you need to know here. Or download the Qantas Assure app on iOS or Android to start earning Qantas Points today. Josephine is a writer from western Sydney who likes to blatantly lie on her bios. She played the youngest sister in 80s sitcom Family Ties and looks fantastic running with a backpack on. *The Qantas Assure App is offered by Qantas and you must be a member of the Qantas Frequent Flyer program and 13 years of age or over to use the App. During the Qantas Assure Wellness Rewards 28-Day Trial, App users will earn Qantas Points without having to purchase an Eligible Qantas Assure Product. Qantas Points earned during this trial will be credited to your Qantas Frequent Flyer account on a fortnightly basis. Once the 28-Day Trial has ended, Qantas Frequent Flyer members who do not purchase an Eligible Qantas Assure Product will accumulate Locked Qantas Points by completing activities through the App. Locked Qantas Points will expire 12 months after the member last accumulated a Locked Qantas Point. Up to 3,000 Locked Qantas Points can be converted to Qantas Points following purchase of an Eligible Qantas Assure Product. Qantas reserves the right to extend or withdraw this offer at anytime.